TORONTO, ON--(Marketwired - February 12, 2014) - The new all inclusive Memories Grand Bahama Beach Resort & Casino has officially opened its doors on February 1, welcoming guests to "celebrate the moments" on the white sands of Lucayan beach, opposite the colourful and charming open air entertainment and dining complex of Port Lucaya. Part of Sunwing's exclusive Family Collection, this perfect vacation haven offers a casino, spa, and free unlimited green fees at the nearby Robert Trent Jones Jr. designed Reef Course. Families will appreciate the teens lounge and supervised kids club with appearances from famous characters, as well as the on-site splash park opening later this month. Everyone can enjoy the daily activities, evening entertainment, non-motorized watersports, and the unique waterslide that wraps around the resort's iconic Sugar Mill. Unlimited all inclusive reservation-free dining options include the Selections international buffet, Bella Cucina Italian restaurant, H Steak House, and The Prop Bar serving pub fare with some island flair. Nagano, the Islands only Japanese Teppanyaki and Sushi Bar, will also be opening this month. International spirits and local specialties flow freely from seven bars including the Social Bar, Beach Bar, and Swim Up Pool Bar. For treats from early morning to evening, guests can indulge in gourmet coffee at Beans Café and taste a variety of flavors from Scoops ice cream bar. Memories Grand Bahama provides guests unparalleled service, deluxe accommodations, and contemporary conveniences. Visitors can enjoy the unique 'All-In Connectivity' features including free Wi-Fi throughout the resort, unlimited in-room calling to North America and most of Europe, and a free Memories mobile app offering the convenience of unlimited free calling while on the resort property, as well as unlimited app-to-app texting. 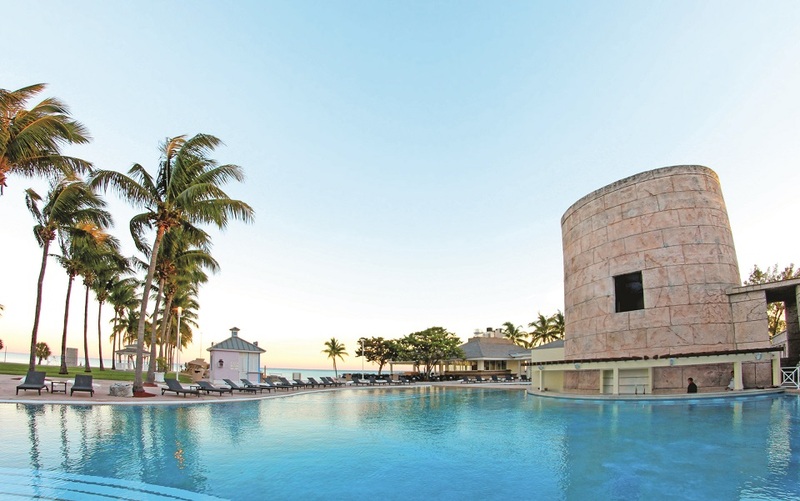 A great place to host events and conferences, Memories Grand Bahama Beach Resort & Casino has almost 500 rooms and suites and is adjacent to the Grand Lucayan Convention Center which boasts 90,000 square feet of indoor and outdoor function space. The resort also offers a range of wedding packages to suit all budgets. Sunwing offers convenient direct flights to Freeport, Grand Bahama Island from five Canadian cities. A one week, all inclusive vacation to Memories Grand Bahama starts from just $945 + $385 taxes per person, departing from Toronto on March 24 and 31, 2014. For more information or to book your vacation today, visit www.sunwing.ca or contact your travel agent. All Sunwing Vacations packages to Freeport, Grand Bahama Island include "Sunwing Airlines' Award Winning Champagne Service," which features a complimentary glass of champagne, hot towel service, hot sandwich served with a choice of wine at lunch and dinner, and complimentary inflight entertainment, including first run movies and a generous free 20kg baggage allowance. For just $40 more per flight segment, travellers can upgrade to Sunwing's Elite Plus service, which features advance seat selection, separate check-in at a majority of airports, advance boarding, 30 kg baggage allowance, priority baggage handling and extra legroom seats. For advertising and promotional opportunities, please contact advertising@sunwing.ca.